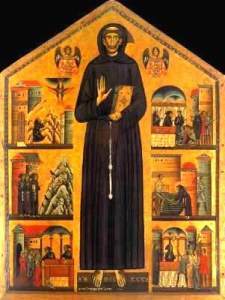 St.Francis, one of the patron saints of Italy (St.Catherine di Siena is the other), was a rebel. He rebelled at the wealth and extravagance of the Church, he divested himself of his clothing in a city square as symbolic of all his worldly possessions. 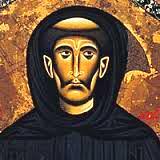 He founded an order of poverty and devotion in his home town of Assisi. We have visited Assisi several times, now packed with visitors of course, but you can imagine the place, strung out on a hillside above the Tiber valley as a place of wealth and peace in the middle of the 12th Century, a quiet market town with wool merchants and farmers at the heart of it’s activity. St.Francis was born in 1182, the youngest son of a wealthy family, as Giovanni. He was renamed Francesco (the Frenchman) because his mother was from Provence and he was taught to speak French. 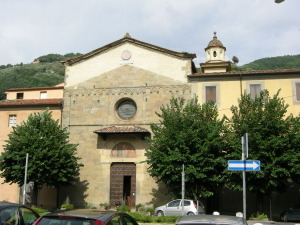 After his wild boyhood and his time fighting in local battles he denounced and denied his family wealth and moved outside the walls of the town to San Damiano and founded his own group of religious followers devoted to a life of poverty; risking as he did the anger of his family, friends and more seriously the ire of the Roman Catholic church. The popularity of St.Francis (he was canonized in 1228, two years after his death) grew gradually though the succeeding centuries and many images of the saint appeared. Reputedly one of the oldest images of the Saint resides in Pescia, Casa Verde’s local town which the Saint visited in 1211. Painted in 1235 by Bonaventura Berlinghieri, from a famous Lucchese painting family, the altar piece is thought to give us a pretty accurate likeness of Francis as it was painted only nine years after his death. It also tells the story of his life in six painted side panels. The life cycle of Francis has been depicted frequently, most famously by Giotto in the Cathedral of St.Francis at Assisi and explains to generations of devotees the importance of his religious experience. The Giotto frescoes there portray wonderfully St.Francis’s love and view of nature, the fantastic colours of trees and flowers in shades vivid and vibrant so true of much of the Umbrian & Tuscan countryside. It is this beauty in the natural world that most residents of these hills truly appreciate whatever else may be happening in the world, and which is portrayed so truly by Tuscan artists. The icon is in the lovely church of San Francesco at Pescia and can been seen there every day. This church is of a simple Romanesque style with a few more ‘modern’ baroque features though the have building remains essentially unchanged in atmosphere from it’s original feel. The lovely wooden roof beams are beautifully carved; the archways above the main body of the church are frescoed in the most fabulous natural colours, their lucidity owes much to the intricacies of the original design and also that they were only recently restored at the end of the last century. It is genuinely a place of peace and must give great comfort to visitors across the road at the town’s main hospital. It is also an important treasure for Pescia, a city not so well known compared to San Gimignano, Volterra and other famous Tuscan cities nearby, but a town that has has it’s own medieval heritage, and it’s own charm and beauty nestling as it does under the Appennine Hills. To all those who booked for Casa Verde this season we look forward to meeting you. To those who haven’t, take a look at what we have to offer in the land of the way’s of St.Francis. As churches ready themselves for the busy Easter season, we at Casa Verde ready ourselves for the new holiday season and the spring growing season. Olive trees are being pruned, ground made ready in the Orto for the vegetables, land being cleared for strimming. Also the first warm sunny days have appeared as the fresh green grass sparkles framing the first spring flowers that appear on the terraces. The vivid blue of Italian crocuses and the lovely violet of bluebells that a previous owner has planted at Casa Verde are a find.